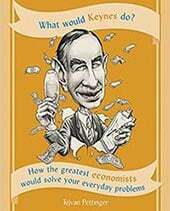 Readers Question: There just seems to be many paradoxical actions taking place in markets and economies at the moment. How do we explain? Despite recession, inflation has been above target. Spending cuts failed to reduce the budget deficit as the government hoped. Despite a longer recession than great depression of 1930s, unemployment is lower than in other more moderate recessions. Quantitative easing (increasing money supply) has not actually increased the money supply ! House prices and other assets have fallen. Therefore, this creates a negative wealth effect and discourages spending. Banks have a funding gap. This funding gap explains why extra money supply from Quantitative easing hasn’t led to higher bank lending – they have been trying to improve their balance sheet. 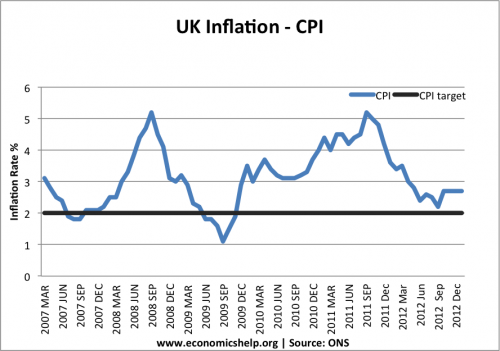 Despite a prolonged recession, inflation in the UK has been above target. Firstly, inflation has only been moderately above target. But, with falling wages, many households have seen a fall in their real wages – inflation has been higher than income growth. Therefore, this moderate inflation has been much more noticeable than usual. If your incomes are rising, you don’t mind price increases. But, this recession has seen an unwelcome combination of rising prices and falling wages – reducing living standards. But, usually in a recession, you would expect a lower inflation rate (lower demand leads to lower prices, higher unemployment leads to falling wages e.t.c). Why has this not occurred? The inflation is not due to the usual causes of inflation (excess demand in the economy). In the latter part of 2012, the UK pound fell in value. 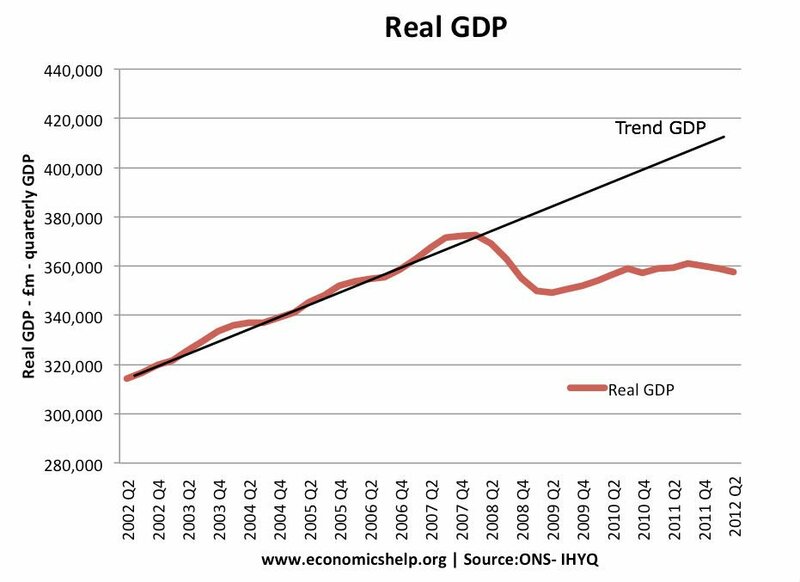 Also, the double dip recession led to lower consumer spending. Usually this leads to an improvement in the current account. 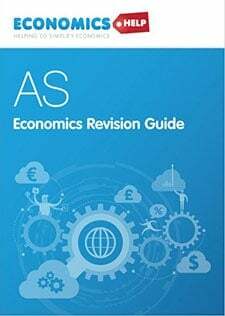 A depreciation makes exports cheaper and imports more expensive. A recession reduces spending on imports. Both should improve the current account. Time lags. Firms absorb part of exchange rate movements and consumers don’t see changed prices. There has been a bigger recession Europe which has hampered UK export growth. In 2010, the new government announced plans to cut the deficit and balance the budget by 2015. They embarked on a policy of austerity – modest tax increases and spending cuts. However, their budget targets have failed – In 2012/13 they will end up borrowing much more than planned when they started in 2010. This is essentially because economic growth has disappointed. With lower economy growth, tax receipts have been subdued and the government have to spend on more automatic fiscal stabilisers. 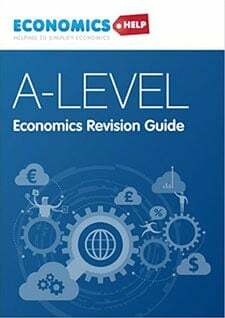 The irony is that the policies to reduce the deficit contributed to the double dip recession and so ironically policies to reduce the deficit have meant it has fallen by much less than expected. 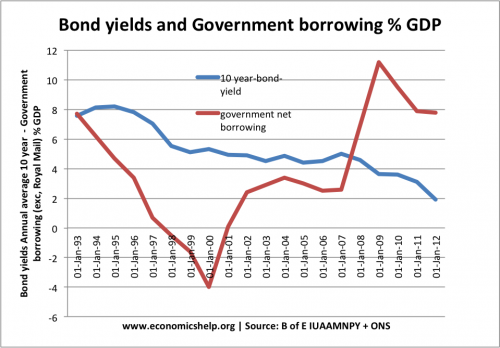 From one perspective you could argue austerity will increase the deficit. High demand from private sector wanting to save more. Prolonged recession meaning people prefer to hold government bonds to private sector investment. 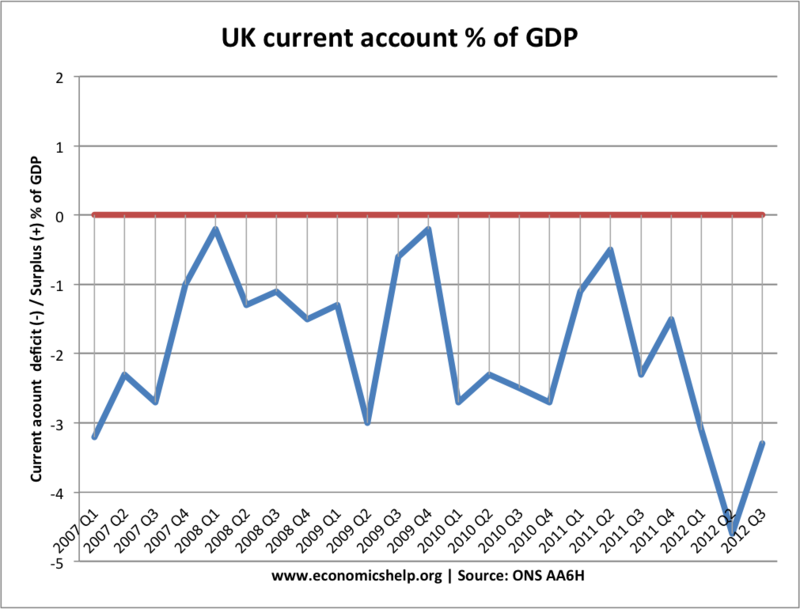 Has Money Supply Actually Increased in UK? Quantitative Easing has led to an increase in the Monetary Base (Narrow money). The Bank of England have created money to buy assets from commercial banks. 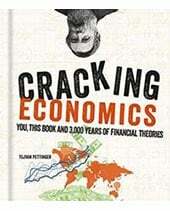 This has seen an increase in bank reserves and the deposits of commercial banks at the Bank of England. However, the impact on broad money supply and inflation has been muted. This suggests that you can print money without causing inflation in a liquidity trap. Q.E. isn’t exactly same as printing money, but the Bank of England have created £375bn of new money. 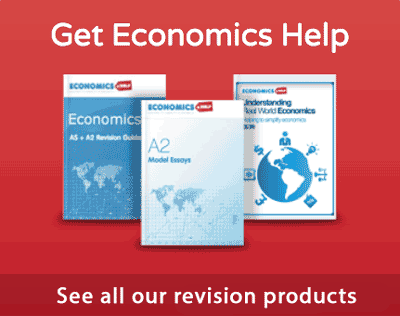 Has Quantitative Easing Been Inflationary? No. Because the increase in bank reserves have not really been lent out to the wider economy. The weak growth of M4 shows that despite the increase in Monetary Base, quantitative easing has not translated into stronger Money Supply growth and underlying inflation. The weakness of underlying inflationary pressure can be illustrated by average wage growth. In the UK average wage growth has been very weak since 2008. In fact, we have seen a fall in real wages. 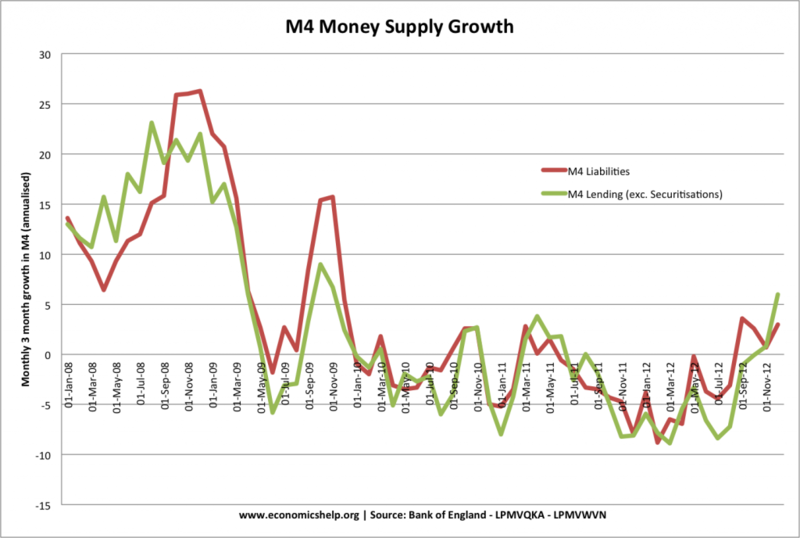 “…without the effects of quantitative easing, M4 money supply growth would have been negative…”. I’m sure you are right. But it would be interesting to see the actual figures (or a chart) showing this for the UK. Please, please do one. The extent to which monetary base replaced commercial bank created credit and other forms of money is estimated in this Credit Suisse study. See charts on the first few pages. there’s a graph at FT showing contribution of Q.E.